In addition to the Hyde Collection books and manuscripts, the bequest from Mary Hyde Eccles included money for the support of the collection, such as to hire curators and catalogers (thanks, Lady Eccles!) as well as funds for new acquisitions to the collection. 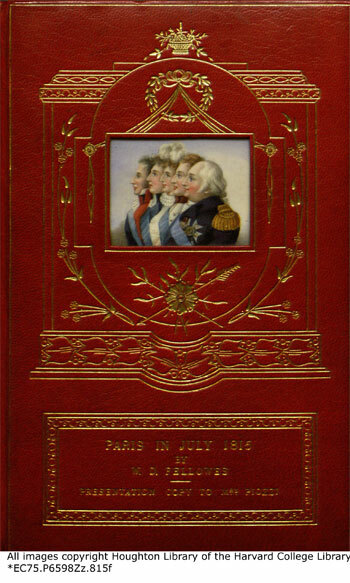 One such recent arrival is this remarkably bound copy of W. D. Fellowes’ Paris, During the Interesting Month of July 1815 — the month of Napoleon’s defeat at Waterloo and abdication, as reported by an Englishman living there. Fellowes was a friend of Hester Piozzi’s, and presented this copy to her. As was her custom, she made several annotations in the margins. The binding dates from almost a century later, done by the famous London bookbinders Riviere & Son. They invented a style called the Cosway binding, named after the English miniaturist Richard Cosway, for the painted ivory miniature inset in the front cover. Unfortunately, this isn’t available to non-subscribers, but the new issue (6/22) of the New York Review of Books has a lengthy review by Frank Kermode of a number of recent Johnson-related books. Several of these were published to coincide with last year’s 250th anniversary of the publication of the Dictionary. Lord Auchinleck, don’t make me angry. You wouldn’t like me when I’m angry. I was very pleased to find that we have a copy of Thomas Rowlandson’s hilarious Picturesque Beauties of Boswell in the rare original wrappers. The vast majority of copies would have been bound, or broken up to display the plates, and the wrappers discarded. The engravings depict scenes from Boswell’s Journal of a Tour to the Hebrides with Samuel Johnson, L.L.D., albeit filtered through Rowlandson’s wickedly satirical imagination. It would be difficult for me to pick a favorite, but for obvious reasons I’m especially fond of this one showing a confrontation between Johnson and Boswell’s father. Although Rowlandson has almost certainly exaggerated the intensity of the disagreement for comic effect, the depiction may owe something to the infamous story of Johnson assaulting the bookseller Thomas Osborne with a stout folio. 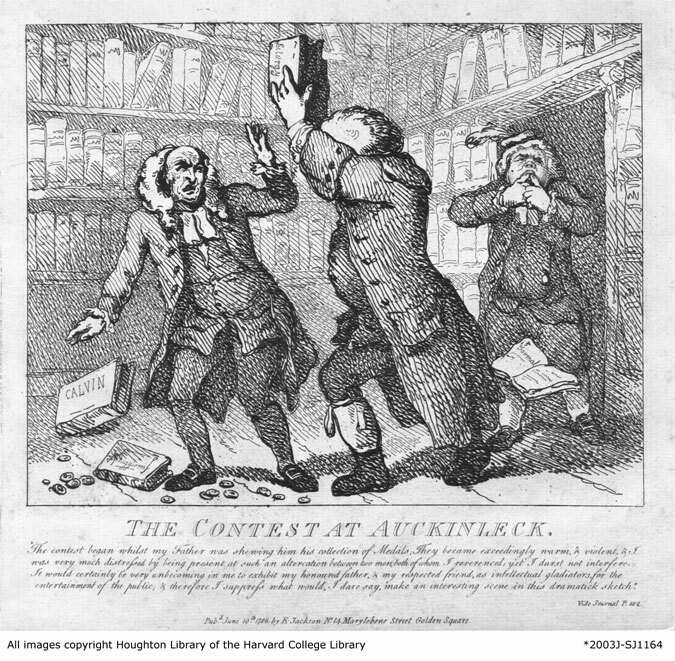 Published in:John Overholt |on June 12th, 2006 |Comments Off on Lord Auchinleck, don’t make me angry. You wouldn’t like me when I’m angry. If you were picking someone to write an insightful and powerful argument in your defense, Samuel Johnson would probably be high on the list. So I would guess that Edinburgh printers Thomas and John Robertson were pleased that their attorney, Boswell, enlisted Johnson to help write the brief in their case. The Robertsons published a newspaper called the Caledonian Mercury, in which they poked some very modest fun at the pretensions of the Society of Solicitors. 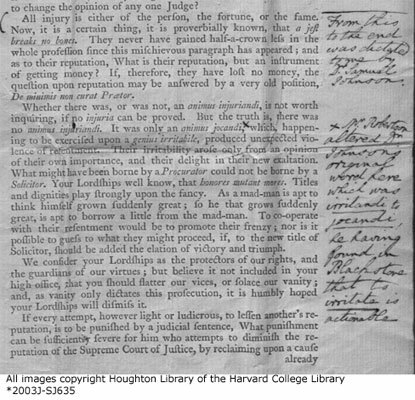 (Boswell writes of the incident “It has been said, that the Scottish nation is not distinguished for humour; and, indeed, what happened on this occasion may in some degree justify the remark.”) The Solicitors were sufficiently unamused to sue for libel, and Boswell was hired for the defense. 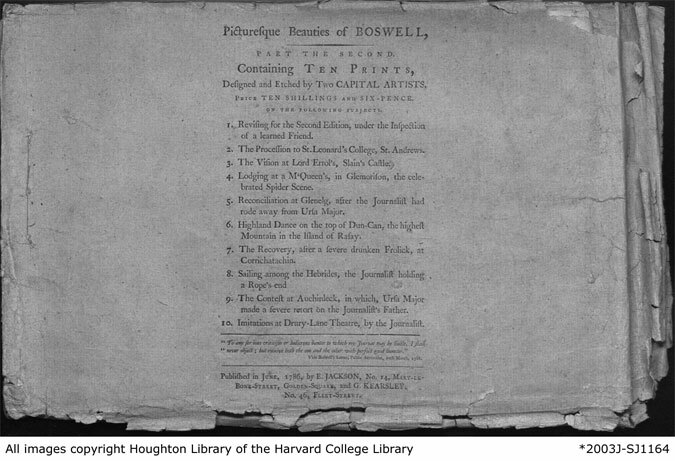 This copy is Boswell’s own, marked by him to indicate the portion written by Johnson.